What is Fiji food like? Find out here for your Fiji vacation/holiday. A diverse mix of multiculturalism in Fiji gives you tasty unique menu options. Fiji's multiculturalism is reflected in it's food offering indigenous-Fijian, Indo-Fijian, Chinese, and western blends. On the whole, it is very palatable for western tastes. Some like me, swear by it. Given that there's a big Fijiian Indian population, you essentially have two styles of traditional food. Indigenous Fijian dishes typically include tavioka (cassava), dalo (taro), fish, and seafood often in lolo (coconut cream). 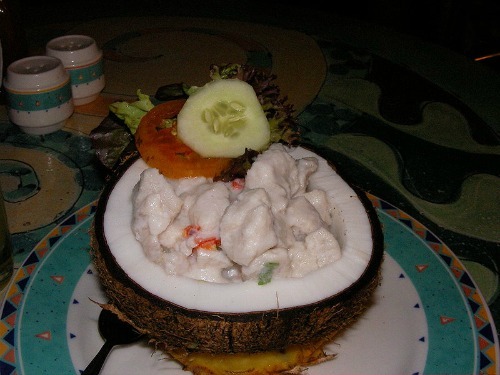 Kokoda (mum's favourite) is a popular dish which is raw fish marinated in lolo with lime juice added. A lovo is a ﻿﻿traditional Fijian feast cooked in an underground pit. Sometimes your resort will set aside a day of the week to put one on. Often, if you are doing one of the many Fiji tours, especially to a village or a cruise to an island, your lunch or dinner will be a lovo. Don't hesitate to participate in one. Indo-Fijian dishes are not too dissimilar of what you'll find in Indian restaurants. A typical meal includes meat (not pork or beef), fish, curry with rice, dahl (lentil soup), and roti (an Indian flat bread similar to naan). A Kokoda meal on the left, and an Indo-Fijian dish down the bottom with roti, one being dipped into the curry. If you are out of the islands, often you can find fresh juices that are a product of local fields possibly even grown by the resort itself, as well as vegetables and seafood. Inquire if unsure. Sometimes your resort has coconuts on standby waiting to be opened and served. A unique experience is when they climb the coconut tree and get a fresh one for you and open it on the spot. Fiji Bitter and Fiji Gold are the common Fijian beers. Other local beers plus imported beers, spirits, and wines are found in bottle shops, and some markets and restaurants. At the resorts and hotels you will find a selection of drinks on the menu to suit most tastes. Kava is the national drink and it's unlikely you'll leave Fiji without trying it, unless of course, you don't leave your cosy air-conditioned resort room. Kava is their national drink, find out more on our Fiji Kava section. 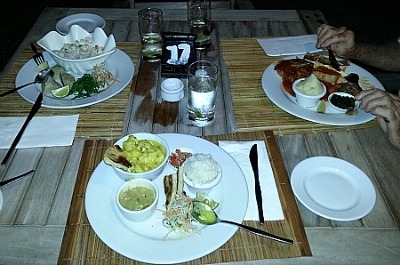 Being a vegetarian in Fiji is quite comfortable. Given that many Indo-Fijians are strict vegetarians, you'll find most restaurants will have at least one vegetarian dish. Even better if you have a liking for Indian food, as Indo-Fijian restaurants have a number of vegetarian options. If you are visiting a village, there are certain etiquettes to adhere to. Your guides will give you the run down. If in doubt, ask so not to offend. Many Fijians eat with their hands and often sit on the floor to eat, especially at home. Men generally eat first, along with visitors. For more information on where to eat, visit our Where to Eat Fiji Foods section.